Find alternative mutual funds offered by Putnam Funds include Putnam Absolute Return Funds, Putnam Diversified Income Trust, etc. Putnam mutual funds are provided by Putnam Investments. Putnam has $156 billion in assets under management. There are 80 mutual funds and 50 institutional strategies across a range of assets classes and investment styles. Top 5 popular funds include Putnam Capital Spectrum Fund, Putnam Diversified Income Trust, Putnam Equity Spectrum Fund, Putnam Equity Income Fund, and Putnam Dynamic Asset Allocation Balanced Fund. These mutual funds can be invested in your brokerage account, 401k plan, retirement account (Roth IRA & traditional IRA). Markets demand new ways of thinking. 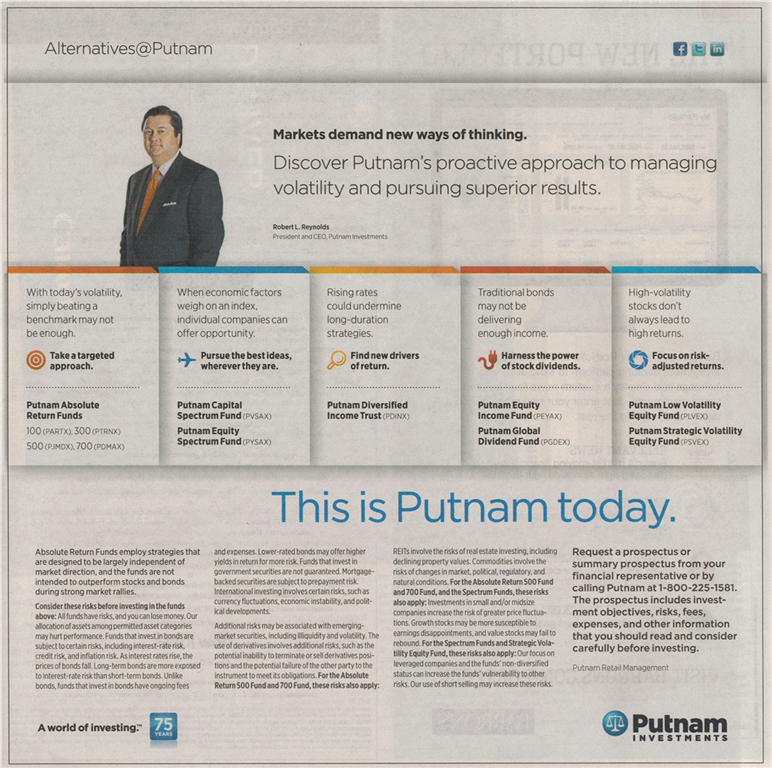 Discover Putnam’s proactive approach to managing volatility and pursuing superior results. 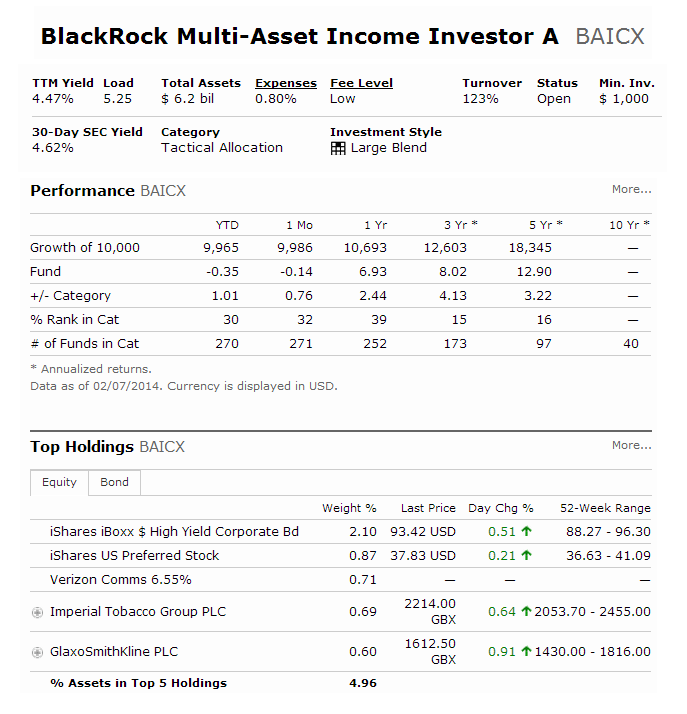 Find BlackRock Multi-Asset Income Fund (BAICX) review. 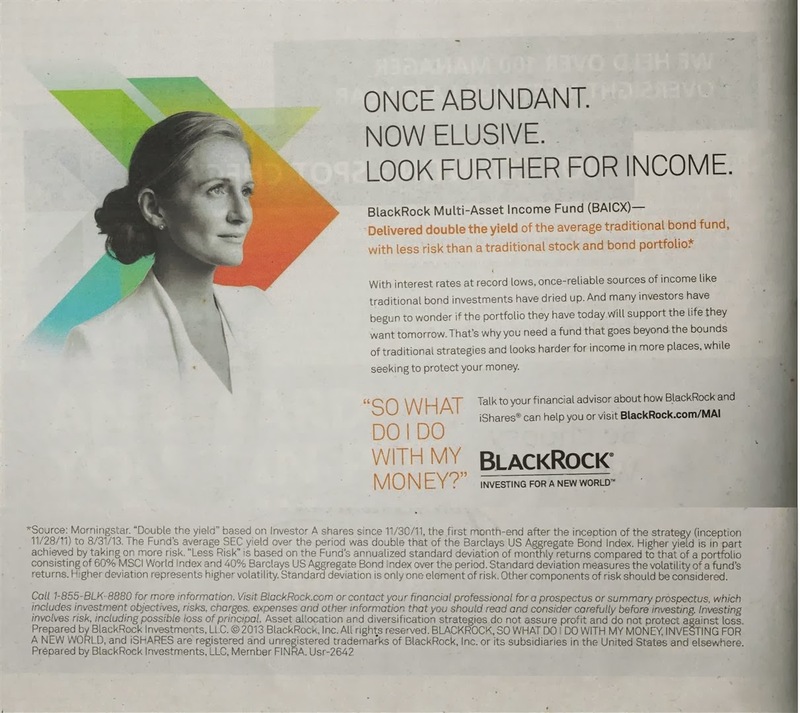 New BlackRock investment ad features this fixed income mutual fund. BlackRock is not only well known with its iShares ETFs. BlackRock also offers variety of mutual funds for your brokerage account, retirement account and 401k plan. The mutual funds include U.S. stock fund, international stock fund, bond fund, municipal bond fund, balanced fund, etc. Recently, BlackRock provides a big advertisement about one of its mutual fund, BlackRock Multi-Asset Income Fund (BAICX). The ad is titled as “Once Abundant, Now Elusive, Look Further for Income.” Whether this mutual fund is suitable for your investment account or not, you should find out the details. I have provided a short review below. BlackRock Multi-Asset Income Fund (BAICX) – Delivered double the yield of the average traditional bond fund, with less risk than a traditional stock and bond portfolio. With interest rates at record lows, once-reliable sources of income like traditional bond investments have dried up. And many investors have begun to wonder if the portfolio they have today will support the life they want tomorrow. That’s why you need a fund that goes beyond the bounds of traditional strategies and looks harder for income in more places, while seeking to protect your money. According to the fund’s website, this BlackRock Multi-Asset Income Fund (BAICX) fund has provided consistently higher income than traditional stocks and bonds. The fund’s objective is to maximize current income with consideration for capital appreciation. It may invest up to 80% of its assets in equity securities and up to 100% of its assets in fixed income securities. The total net assets are $5.9 billion. It also has a high yield of 4.37%. Morningstar analysts rank this bond fund with 4-stars and Neutral rating. The annual expense ratio is 0.80%. The YTD return as of January 20, 2014 is 0.14%. It has 5-year annualized return of 13.23% and 3-year annualized return of 8.63%. The fund has always returned positively since its inception in 2008. The fund managers are Michael Fredericks, Peter Wilke, Philip Brides and Justin Christofel. The class C (BCICX) has annual expense ratio of 2.03% and the Institutional Class (BIICX) has 1.03%. The top portfolio allocation is Global Developed Equity (31.4%) and High Yield Bonds (24.4%). As of the third quarter of 2013, the top equity holdings are Imperial Tobacco Group (0.7%), Roche Holding (0.6%) and Sanofi (0.6%). The top fixed income holdings are iShares iBoxx USD High Yield Corporate (5.8%) and iShares US Preferred Stock ETF (1.1%). This class A fund has a big sales load of 5.25%. Try to find other asset class if you want to invest. Performance wise has been good during the past 5 years. This best fund is also ranked with high rating by Morningstar. It has low minimum initial investment of $1,000 for regular brokerage account. 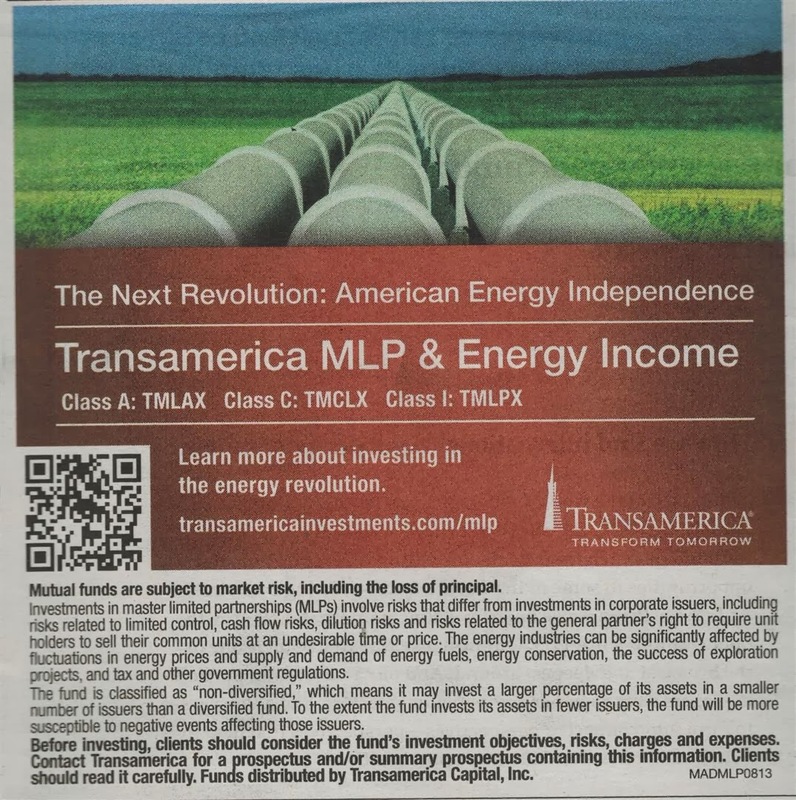 Find Transamerica MLP & Energy Income Fund review. This mutual fund invests in energy master limited partnerships (MLPs). TMLAX fund is a new equity energy mutual fund. Transamerica recently placed an ad in Barron’s financial magazine. 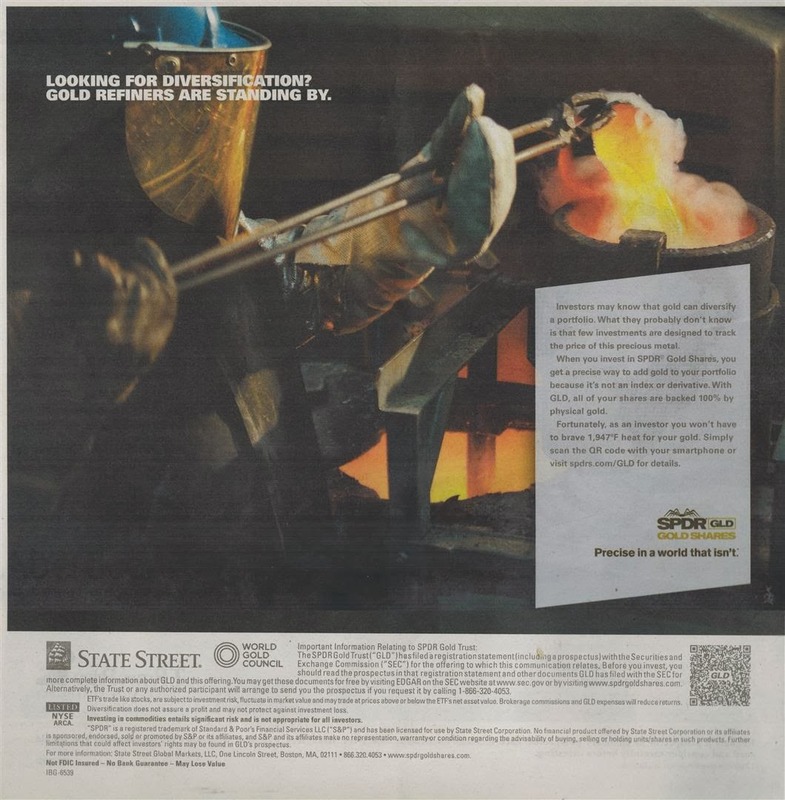 The advertisement is titled as “The Next Revolution: American Energy Independence.” This investment ad provides one new equity energy sector mutual fund. It invests in various energy companies especially master limited partnerships. Should you invest in these mutual funds? Whether they are for your brokerage account, retirement account (IRA), or 401k plan, you need to find the funds details. Learn more about investing in the energy revolution. Mutual funds are subject to market risk, including the loss of principal. Before investing, clients should consider the fund’s investment objectives, risks, charges and expenses. Contact Transamerica for a prospectus and/or summary prospectus containing this information. Clients should read it carefully. Funds distributed by Transamerica Capital, Inc.
Find Powershares currency ETFs ad. This Invesco advertisement has 3 currency exchange traded fund: US Dollar Bullish Fund, US Dollar Bearish Fund, and G10 Currency Harvest Fund. Currency investing is not only done through Forex (foreign exchange) or brokerage nowadays. You can choose investment funds such as exchange traded funds, mutual funds, or closed end funds. These investment funds may invest in single currency or multiple currencies for return. 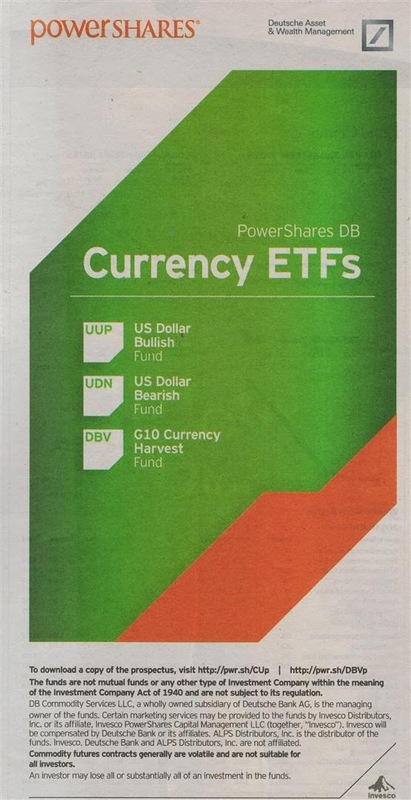 Recently, Invesco PowerShares provide a big advertisement about some of their currency ETF funds. There are 3 funds such as PowerShares DB US Dollar Index Bullish, PowerShares DB US Dollar Index Bearish, and Powershares DB G10 Currency Harvest Fund. You can buy these currency funds through your brokerage for long term investment or short term trading. Find Powershares Commodity ETFs for your investment. There are 8 commodity exchange traded funds below including oil, gold, agriculture fund, etc. Investing in commodities has become popular and easier as various commodity investment funds being introduced. There are variety of commodity funds such as mutual funds, exchange traded funds, or closed end funds. 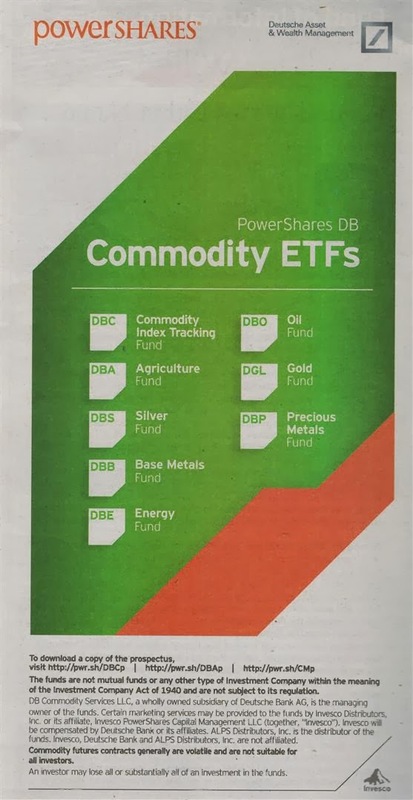 This article will look into recent ads by Invesco Powershares about commodity ETF funds. You may be able to invest in them for asset allocation or diversification. Whether the commodity is oil, gold, silver, corn or soyabeans; you can invest in any commodity through exchange trade funds. You can find 8 different commodity ETFs offered by Invesco Powershares. Find the fund review below. Ivy Science and Technology Fund (WSTAX) is a top sector stock mutual fund. Find equity fund review and news by Ivy Funds. Should you invest in this top mutual fund? Whether it is in your brokerage account, retirement account (IRA), or 401k plan, you need to find the fund details. Find the fund review below. Innovation can be a catalyst for change, giving companies a true competitive edge. In turn, this can create growth opportunities for investors. The Ivy Science and Technology Fund takes a broad view of innovation, investing in both the companies driving innovation as well as those applying these innovations to improve business efficiencies. At Ivy Funds, we use a collaborative process – born on rigorous debate, hands-on research and a proven cross-disciplinary approach – to fully assess the opportunities we pursue on behalf of our investors every day. To learn more, visit ivyfunds.com. Find FlexShares Ready Access Variable Income Fund (RAVI) review. This ETF fund is managed by Northern Trust. Whether you should invest in your brokerage, retirement, or 401(k) account; you need to do a thorough research. Find this ETF fund review below. I have provided the details such as expense ratio, yield, etc. Also find out whether there is a risk or not associated with this new ETF. Finally, short-term liquidity with solid return potential. Looking for greater return potential from your short-duration fixed income investments? 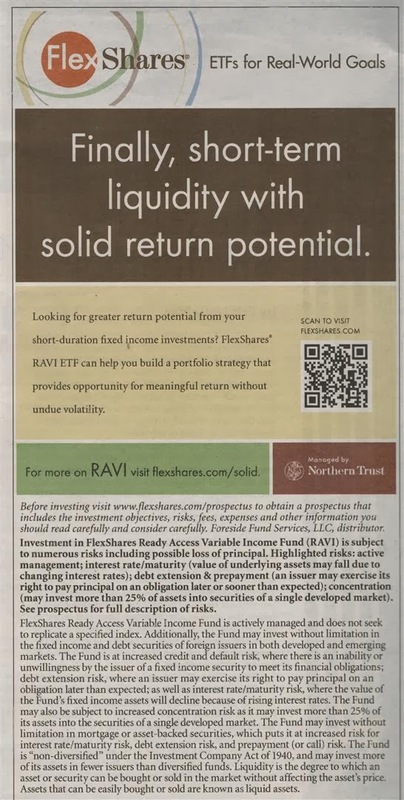 FlexShares® RAVI ETF can help you build a portfolio strategy that provides opportunity for meaningful return without undue volatility. 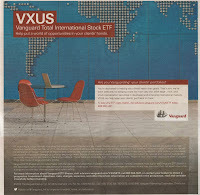 Find Vanguard Total International Stock ETF Fund (VXUS) review. This index exchange traded fund invests in non-U.S. companies. It also has a low expense ratio. Vanguard is a leader in low cost investing including mutual fund and exchange traded fund (ETF). With low cost Vanguard ETFs, you can diversify your investment through various investment options. These index ETFs is tracking its index. 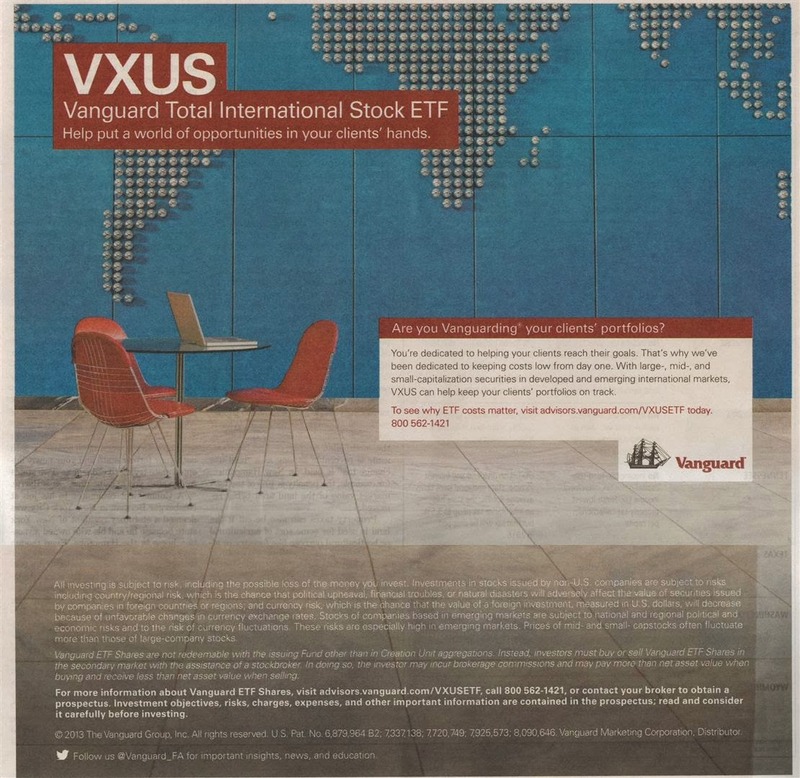 One of the top Vanguard ETFs is Vanguard Total International Stock ETF Fund. Should you buy this top ETF for your brokerage, retirement, or 401(k) account? Find my fund review below. Select the best funds for your investing account or long term account. I provide various aspects of review including fund performance, returns, expense fee, rank, and more. Help put a world of opportunities in your clients’ hands. Are you Vanguarding your clients’ portfolios? You’re dedicated to helping your clients reach their goals. That’s why we’ve been dedicated to keeping costs low from day one. With large-, mid-, and small-capitalization securities in developed and emerging international markets, VXUS can help keep your clients’ portfolios on track. Find SPDR Gold Trust ETF fund (GLD) review. This exchange traded fund invests mainly in gold bullion. Using fund for gold investing is popular among investors or traders nowadays. As one of the precious metals, gold price has been increasing since 2008. One of the popular ETF fund for gold investment is SPDR Gold Trust ETF fund (GLD). Gold offers investors an attractive opportunity to diversify their portfolios. Recently, financial news has produced various ads about this exchange traded fund. Whether the investment is for your brokerage or 401(k) or retirement account, you need to find out the details about the funds. Find the fund review including the fund details, expense ratio, yield, etc. I also include the investing ads for your review as wells. There are two advertisements which I have seen. Gold Refiners are Standing By. Investors may know that gold can diversify a portfolio. What they probably don’t know is that few investments are designed to track the price of this precious metal. When you invest in SPDR Gold Shares, you get a precise way to add gold to your portfolio because it’s not an index or derivative. With GLD, all of your shares are backed 100% by physical gold. Find article about Oppenheimer International Growth Fund for investing. 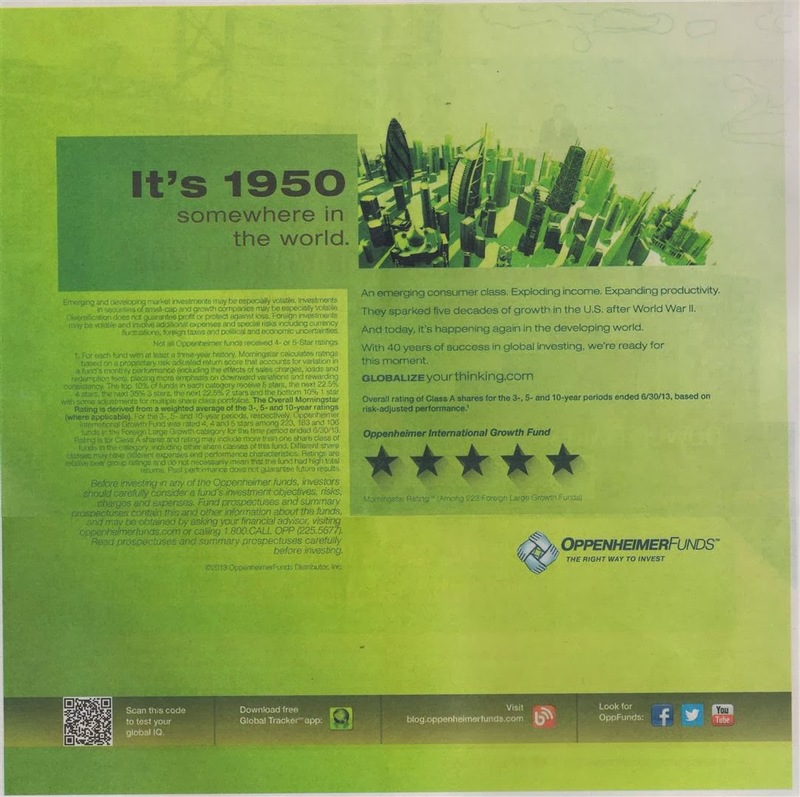 This post provides mutual fund ad by OppenheimerFunds. 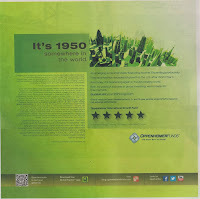 If you read a recent financial newspaper or magazine, you might find the Oppenheimer ad about best international stock mutual fund, Oppenheimer International Growth Fund. This equity mutual fund is ranked with 5 stars rating by Morningstar. Whether this top fund is suitable for your investment account or not, you should find out the details. Investing in your brokerage account, 401(k) account, and retirement account needs extensive research and study especially for long term investment. Find out the fund performance and details below. It’s 1950 – somewhere in the world. An emerging consumer class. Exploding income. Expanding productivity. They sparked five decades of growth in the U.S. after World War II. And today, it’s happening again in the developing world. With 40 years of success in global investing, we’re ready for this moment. Overall rating of Class A shares for the 3-, 5- and 10-year periods ended 6/30/13, based on risk-adjusted performance. Find article about investing in PIMCO StocksPlus Funds, part of top stock mutual funds. As non-traditional equity fund, it uses equity indexing and bond management in its strategy. 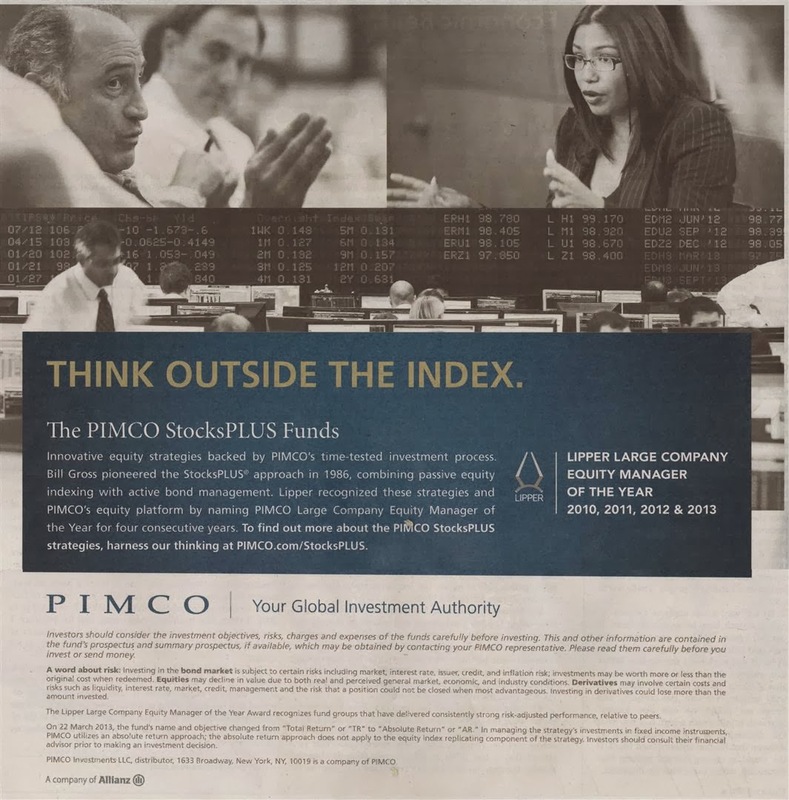 Looking through various investment ads, you will find one from PIMCO about PIMCO StocksPLUS Funds. This ad doesn’t show any specific mutual funds. By visiting to the website you will find there are 2 mutual funds: PIMCO StocksPLUS Absolute Return Fund (PSPTX) and PIMCO StocksPLUS Fund (PSTKX). Find out whether these equity mutual funds is suitable for your investment brokerage account, retirement account (IRA), or 401(k) account. Whether these top funds are suitable for your investment account or not, you should find out the details. Innovative equity strategies backed by PIMCO’s time-tested investment process. Bill Gross pioneered the StocksPLUS approach in 2986, combining passive equity indexing with active bond management. Lipper recognized these strategies and PIMCO’s equity platform by naming PIMCO Large Company Equity Manager of the Year for four consecutive years. To find out more about the PIMCO StocksPLUS strategies, harness our thinking at PIMCO.com/StocksPLUS. Find investing info about Alerian MLP ETF (AMLP). This exchange traded fund invests in leading energy infrastructure Master Limited Partnership (MLPs). 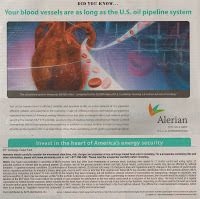 If you read a recent financial newspaper or magazine, you might find various Alerian MLP ETF ads. These ads provide one energy sector related exchange traded fund. This ETF is traded like stock and has high yield for income. Whether this top ETF fund is suitable for your investment account or not, you should find out the details. Investing in your brokerage account, 401(k) account, and retirement account needs extensive research and study especially for long term investment. Find out the fund performance and details below. The circulatory system measures 60,000 miles, compared to the 55,000 miles of U.S. trunk lines moving 5.6 million barrels of oil daily. 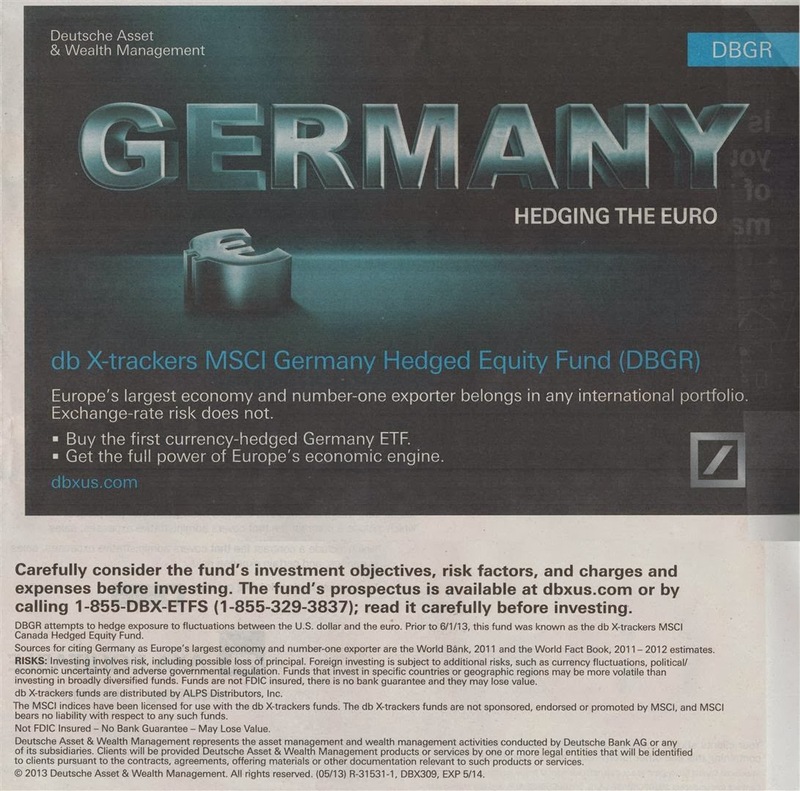 Find investing ad about db X-trackers MSCI Germany Hedged Equity Fund (DBGR) by Deutsche Asset & Wealth Management. It invests in German company equities and tracks the MSCI Germany US Dollar Hedged Index. 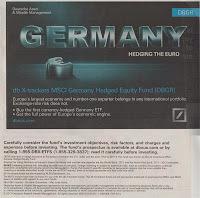 Reading an investment news or magazine, you will find an ad about “Germany - Hedging the Euro.” The ad provides one ETF for investing, db X-trackers MSCI Germany Hedged Equity Fund (DBGR). You can invest in this exchange traded fund (ETF) in your investment or brokerage account, or retirement account. While the ad looks promising, you should do more research before investing in this equity ETF. Whether the investment is for your brokerage or retirement account, it is important to understand the risk and investment strategy of this ETF fund. I have provided a fund review below. Europe’s largest economy and number-one exporter belongs in any international portfolio. Buy the first currency-hedged Germany ETF. Get the full power of Europe’s economic engine. 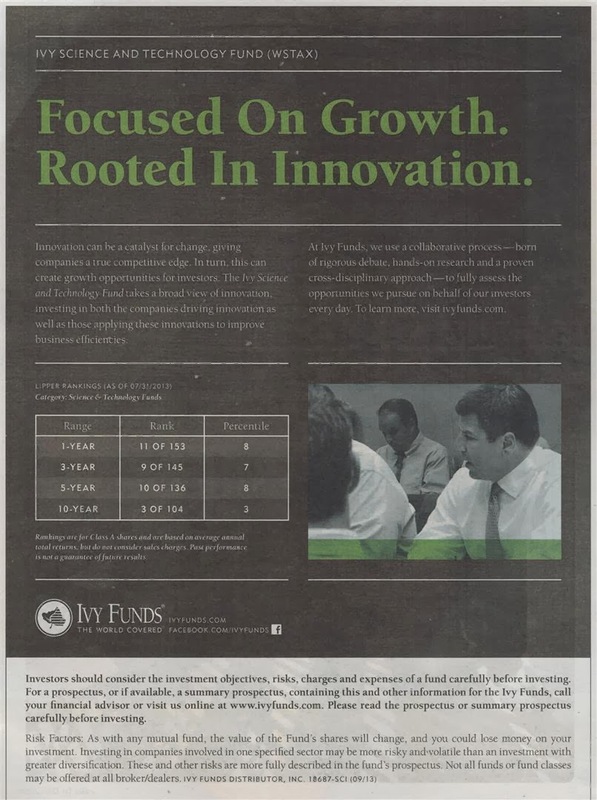 Find iPath S&P MLP ETN (IMLP) Fund ad in financial news or magazine. This exchange traded note is similar to exchange traded fund (ETF) and invests in pipeline, diversified energy infrastructure. 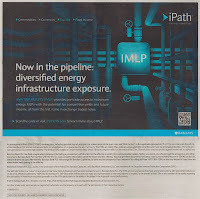 If you read recent financial news, you might find an ad about “iPath S&P MLP ETN (IMLP).” This ETN invests in companies traded in the GICS Energy Sector and GICS Gas Utilities Industry. Some of the companies include Buckeye Partners LP, Energy Transfer Equity LP, Kinder Morgan Energy Partners, etc. You can find iPath S&P MLP ETN (IMLP) review below. Is this ETN fund suitable for your brokerage account or retirement account or not? Find the review below. I have provided in depth details about the fund performance, expense ratio fee, top holdings, and more. Now in the pipeline: diversified energy infrastructure exposure. 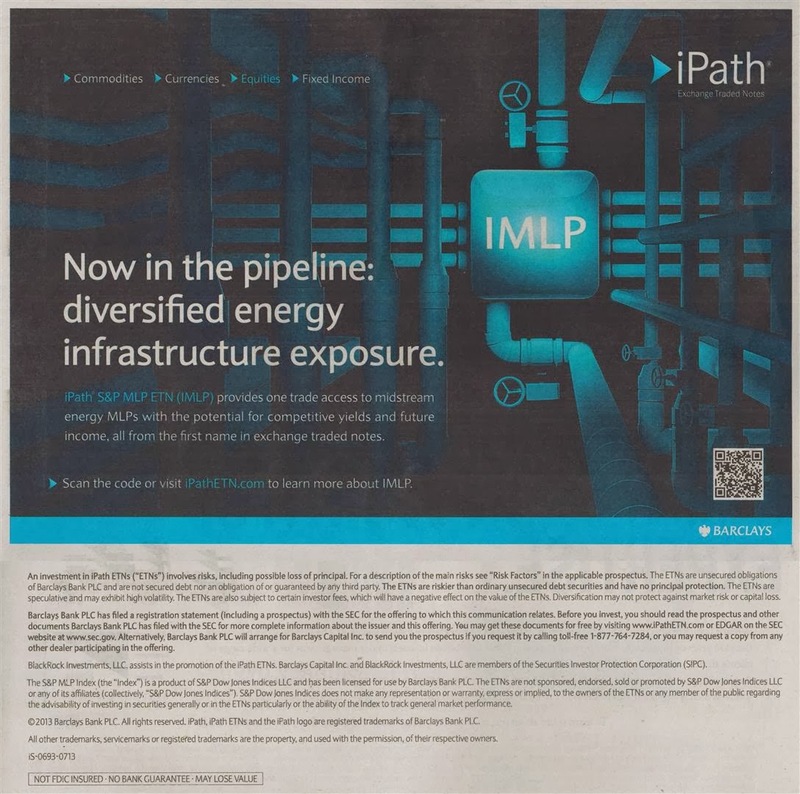 iPath S&P MLP ETN (IMLP) provides one trade access to midstream energy MLPs with the potential for competitive yields and future income, all from the first name in exchanged traded notes. Scan the code or visit iPathETN.com to learn more about IMLP. Find ad of WisdomTree U.S. Small Cap Dividend ETF fund (DES) by WisdomTree Investments in financial newspaper. This exchange traded fund has high yield for dividend income and invests in small cap companies. Investment ad is popular in financial magazine or newspaper. You may find tons of advertisements inside them. Recently, you may find this DES, The Only U.S. Small Cap Dividend ETF by WisdomTree ad in financial newspaper or magazine. You would ask “Should I invest in this fund or not?” This is very typical first question for long term investor including retiree. Investing long term for your brokerage account or retirement account or 401(k) account needs deep review and analysis. Find the fund review below as well. There are risks associated with investing including the possible loss of principal. Funds focused on smaller companies may experience greater price volatility. Find Hartford World Bond Fund ad by HarfordFund. This mutual fund invests in international debts round the world. The investment advertisement is titled as Think outside the States. Investing internationally can be done through many different ways. Using a mutual fund, investors can invest in international bond or stock funds. Recently, HartfordFund produces an investment ad which title “Think outside the States.” This ad features one top bond mutual fund, Hartford World Bond Fund (HWDAX). Whether the investment is for your long term retirement account or short term brokerage account, you need to find out the fund review and details. I will provide this bond fund review below. Note: This advertisement can be found in financial newspaper or magazine. 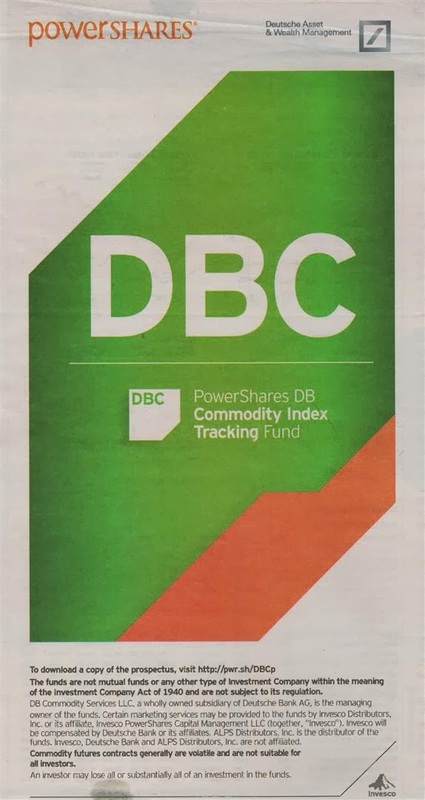 Find PowerShares DB Commodity Index Tracking Fund (DBC), an Invesco ETF fund ad. This exchange traded fund invests in various commodities similar to its index benchmark. There has been lot of ETF fund or exchange traded fund being introduced for investors or traders. The exchange traded fund may track various indices such as U.S. stock (S&P 500), international stock, corporate bond, municipal bond and many more. One of these ETF funds is PowerShares DB Commodity Index Tracking Fund (DBC). 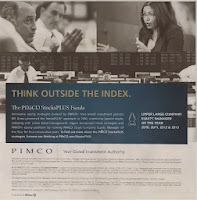 Invesco has provided an Ad in various financial newspaper or magazine. Find this ETF fund review below. I have provided the details such as expense ratio, yield, etc. 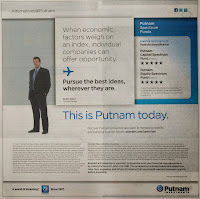 Find Putnam Spectrum mutual funds investment ad on latest financial newspaper. These top mutual funds are part of moderate allocation fund and U.S. stock fund. 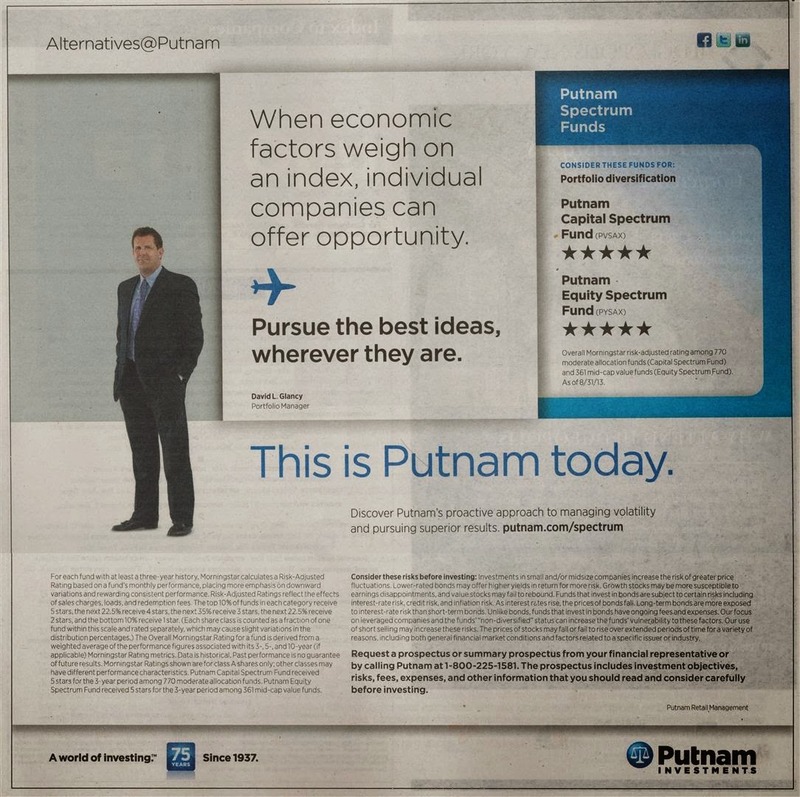 Looking through a financial newspaper recently, you will find a full page of investing ads about top Putnam mutual funds. This ad provides two top rated mutual funds for your investment accounts including 401(k), IRA (individual retirement account), and regular brokerage account. Should you or shouldn’t you invest in these mutual funds? You will find the answer below. I have provided the fund review, performance, and more for your reading. Let me know if you have any comments below. When economic factors weigh on an index, individual companies can offer opportunity. 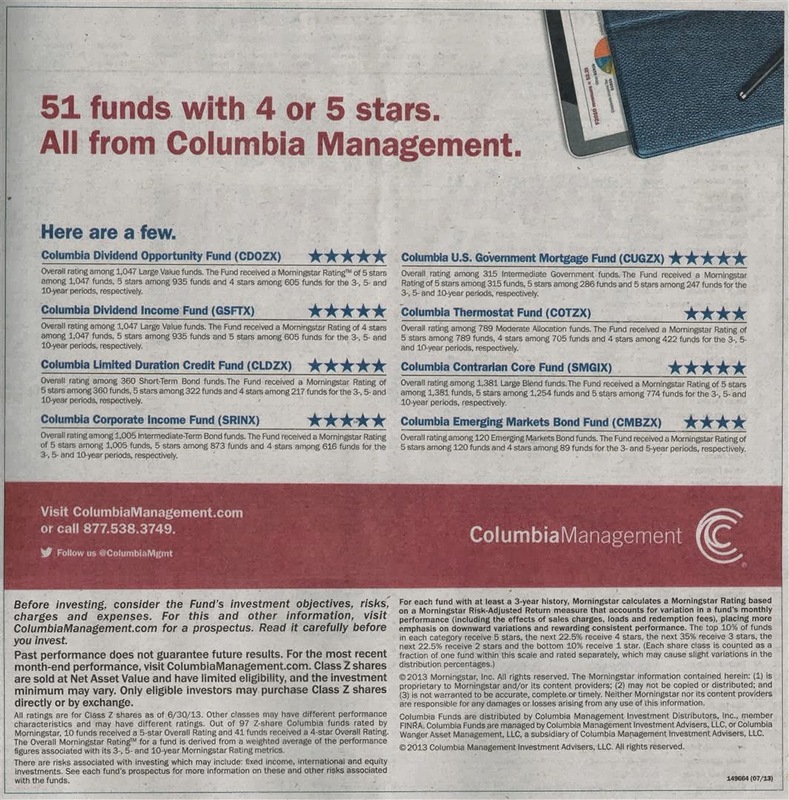 See top mutual funds ad by Columbia Management for investing. You may find these best bond and stock mutual funds for your financial account including 401(k), IRA and brokerage account. Flipping through a financial magazine or newspaper like Bloomberg or Barron’s, you will find lots of investing ads. 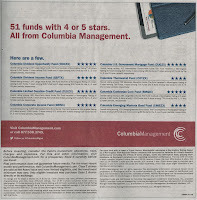 One of the ads is Columbia Management ad about their best mutual funds. Columbia ad provides a diverse selection of top funds including U.S. stock mutual fund, bond mutual fund, emerging market bond fund, and balanced fund. Should you invest in your brokerage, retirement, or 401(k) account? Find my fund review below. Select the best funds for your investing account or long term account. I provide various aspects of review including fund performance, expense fee, sales load, etc. 51 funds with 4 or 5 stars. Find best global stock mutual funds, an Investment ad by Artisan Partners on financial magazine. These top international equities funds provide diversification opportunity for investors. 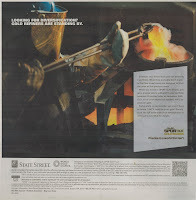 If you read a recent financial newspaper or magazine, you might find the Artisan ad about best global stock mutual funds. Artisan Partners provides three best world stock mutual funds for investment. These international stocks have high ranking among its peers. Whether these top funds are suitable for your investment account or not, you should find out the details. Investing in your brokerage account, 401(k) account, and retirement account needs extensive research and study especially for long term investment. Find out the fund performance and details below. As businesses transcend borders, a global investment approach can provide an edge in selecting the most attractive investment opportunities across the globe. Expand your portfolio’s potential by investing globally.